Want to know if you can reduce your mortgage interest rate? If you are looking to reduce your mortgage interest rate, you may want to consider refinancing. Learn about refinancing from a leading home refinance lender. What should I know about an interest rate refinance? Refinancing can be effective if you consider your goals and select the option that may be right for you. Consider the following. You can reduce your payment by refinancing when mortgage interest rates drop sufficiently below your existing rate. As another option, you can refinance to a longer term mortgage to lower your monthly payment, though you will raise your overall interest costs. With either option, you can pay discount points to further reduce your interest rate. To learn more, see Lower Monthly Payments. 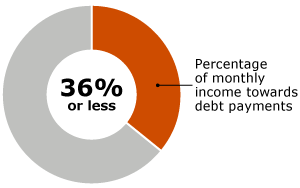 Refinance to a shorter term to raise monthly payments for faster repayment and reduce your overall interest payments. If mortgage interest rates are low enough, you may be able to get a shorter-term loan for faster repayment without a significant increase in your monthly payment. To learn more, see Pay Off Mortgage Sooner. A cash-out mortgage refinance can affect your mortgage interest rate and provide funds for home improvement, debt consolidation, and other major expenses. To learn more, see Get Cash From Your Home. You can explore your options before your payment adjusts to see if refinancing may be right for you. To learn more, see Convert to a Fixed Rate. Combine a Wells Fargo first mortgage with a home equity line of credit so you can access your equity as you need it. You complete only one application, work with a single contact, and attend one simultaneous closing transaction for both products. You can choose from a variety of financing options. Read more about Mortgage + Home Equity Financing. When interest rates are low, you might consider refinancing your mortgage. Refinancing may allow you to replace your current loan with a new mortgage that has better terms. 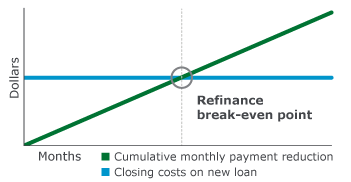 Here are some of the potential benefits of a refinance. 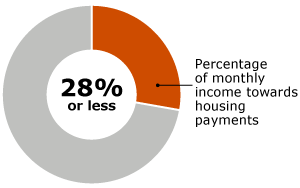 Your loan’s monthly payment typically decreases with a lower mortgage interest rate. With a lower payment, you can use the extra funds for retirement savings, paying other debts, saving money for college, or other purposes. If you have an adjustable-rate (ARM) or a balloon mortgage, reduced interest rates may make a fixed-rate mortgage more desirable, especially if you want the stability of an interest rate that does not change over time. If you have a long time left on your mortgage, lower interest rates may make it possible to switch to a shorter-term mortgage. You can pay the principal balance down and build equity faster. You may pay less interest over the life of the loan with a shorter term loan. If you have a jumbo loan, you may be able to refinance to a "blended jumbo" (Mortgage + Home Equity Financing). While you’re lowering your interest rate, you may want to consider using the equity in your home to pay for major purchases or to make home improvements. This type of loan is known as a cash-out refinance. See how much available equity you have for a cash-out refinance with a free refinance analysis. How can I decide if refinancing may be right for me? Your home may be the largest asset you have. Before deciding to refinance, be sure to consider the following so you can make an informed decision. An origination charge , which may include fees such as application or processing. Discount points to lower your interest rate further. (May be tax deductible. Consult your tax advisor regarding deductibility). A prepayment penalty if your current loan has a penalty for early payoff. Other settlement charges such as appraisal, credit report, title search, and title insurance fees. You may be eligible for a reduced reissue or refinance rate on your title insurance if the property's current policy was issued recently. Ask your title or closing agent if you qualify. If you plan on owning the home for an extended period of time, and the interest rates are 1/2% to 5/8% lower than your current rate, refinancing may be the right choice for you. Your break-even point occurs when your savings from your new loan equals the cost of getting the new loan. Keep in mind that you are starting over. Refinancing replaces your existing loan with a new one. If you refinance back to the same loan term on the new mortgage, you may pay more additional interest than you would if you refinance for a term that is the same as or shorter than that of your original loan. Use our refinance calculator to help determine if refinancing may be right for you. How will you evaluate my home financing application? It's a good idea to check your credit history and correct any problems before applying. Wells Fargo also offers a series of online credit education videos. Do you have enough funds for a down payment (if you're buying a home) and closing costs? If you're buying a home, in some cases, you may be able to use gift funds toward closing costs and all or part of your down payment. We approve applications where we believe the borrower has the ability to repay according to the terms of the financing. We use two ratio-based guidelines to evaluate your ability to repay. What can I do if I am having difficulty making payments? If you’re facing payment challenges, don’t wait another day. We’re here to help you understand your options. We can help you get started learning about different home loans. Below are a few options you may want to consider based on features that may be important to you. To see additional home loans, visit our Loans & Programs area. We focus on your mortgage and home equity needs with the goal of delivering a straightforward and convenient application experience. Let us show you how easy it is to apply for mortgage or home equity financing with Wells Fargo. Review our homebuying application checklist (PDF) or refinance application checklist (PDF) to learn more. Call us at 1-877-937-9357, Monday – Friday, 7:00 am – 9:00 pm, and Saturday, 8:00 am – 4:30 pm Central Time. Find a local consultant and start the application process by phone or in person. Request a personal consultation to have a home mortgage consultant contact you. Once you apply, you’ll receive important disclosures about your loan. If your loan is eligible to be tracked through yourLoanTracker, you’ll receive a notification from your home mortgage consultant. Do I need to pay a fee to submit a mortgage application? Yes, there is a fee to apply for a mortgage. Fees cover the cost of the credit check, verification of your financial information, and property appraisal. Fees vary by loan type and the location of the property. Your home mortgage consultant will provide specific fee details during the application process including when the fees need to be paid. Is there an advantage to locking in my pricing? If you want to avoid the possibility that interest rates will rise before you close on your home loan, you can lock in your loan pricing after your mortgage application is completed. Are the features different for some types of mortgage loans? Yes, if you're purchasing a newly built home, some additional loan options may be available. When you're purchasing a home from a builder, the mortgage application process is very similar to the process for buying an existing home. However, on loans for newly built homes, you also have the option of choosing our Builder Best® Extended Rate Lock program. Our exclusive Builder Best Extended Rate Lock program can help protect you from changing interest rates while your home is being built. With a required, non-refundable extended lock fee, you can lock down a range of interest rates and focus on what really matters most — building your new home. Your interest rate range is protected. Lock in your interest rate range anywhere from 5 to 24 months depending on the type of loan you select. You have options. You may be qualified for a one-time float down option to a lower rate or a different loan program. Talk to a home mortgage consultant about this possibility. Visit Buy a New Construction Home for more information. Do I need to pay a fee to submit my home equity application? There is no fee to submit a home equity application and we will pay closing costs for services required by the bank. If you’re a Wells Fargo customer, you may also benefit from additional discounts. What should I consider when applying for home equity financing? Make sure your requested line of credit amount is between $25,000 and $500,000 (some state restrictions apply). For larger line amounts, please contact us. Carefully evaluate how much you need. Your requested amount plus the existing mortgage balance and any other outstanding liens against your property should be less than 80% of your home's current value. Provide a conservative estimate of the value of your home. Track the status of your application by signing on to yourLoanTracker. Ask about special interest rate discounts for Wells Fargo customers. After you apply for your mortgage or home equity line of credit, we'll work with you to ensure that the process is a straightforward and satisfying experience. What happens after my home equity application is submitted? Let you know the status of your application within a few business days. Request additional information such as financial documentation and income verification. Order appraisal, title insurance, flood certification, and other services as necessary. You can also track the status of your application 24 hours a day, 7 days a week with yourLoanTracker. How does the home equity closing process work? Choose to close in a Wells Fargo bank branch, or from the comfort of home by mail if available. To keep things moving, be sure to sign and return all requested documents as soon as possible. If additional documents are requested, you can learn more about them in our document library. Your home equity specialist can help you understand what may be required. We'll activate your account after we receive your signed documents and your right-to-cancel period, if any, has expired. You’ll be able to access your available credit with your Enhanced Access® Visa® credit card, access checks, Wells Fargo Online® banking, or your ATM card. After you close, you can manage your account online. Wells Fargo Online® gives you convenient access to account information, tax data, and payment options. Learn more about online payments or enroll in online banking. How can I keep track of my home equity application status? What can I do to help my home equity financing close on time? Monitor yourLoanTracker to keep track of your progress. Make sure you sign all relevant documents, get them notarized (as needed) and return them to us as soon as possible. How does the mortgage closing process work? Ensure all loan approval and closing conditions have been met. Confirm or set a closing date to sign your loan documents. Review the title insurance to make sure you have rights to the property. Review your homeowners insurance policy to make sure you have adequate coverage. Before your closing, you'll receive your final disclosures confirming the amount of money you'll need, so you can arrange to have funds available for your closing. We'll send the closing documents to your closing agent. On your closing day, review the documents carefully with your agent, then sign and date them. If you're buying a home, collect the keys and move in. Congratulations! If you're refinancing a mortgage on your principal home (not a vacation or investment property), you have a three-day right-of-rescission to cancel the transaction. After your loan closes, you can manage your account online. Wells Fargo Online® gives you convenient access to account information, tax data, and payment options. Learn more about online payments or enroll in online banking. How can I keep track of my mortgage application? What can I do to help my mortgage close on time? Provide accurate information during your loan application interview. Discrepancies in your credit history, employment history, or current bank account balances could delay your loan process. Help keep your application moving by submitting requested documents promptly. Learn more about documents we may request in our document library. Do not make big purchases, take on additional debt, transfer large amounts or make large deposits unrelated to your loan, until after your closing. Are the features different for other types of mortgage loans? Yes, loans for newly built homes may have additional loan options and different requirements. Choose from a large variety of mortgage products. With a required, non-refundable extended rate lock fee, you can lock in a range of interest rates from 5 months and up to 24 months depending on the loan product with our Builder Best® Extended Rate Lock program. Your home mortgage consultant will help you find a loan option that works for you. After your mortgage or home equity financing closes we provide a variety of ways to manage your account online. View account activity, transfer funds, make payments, and more — anytime, anywhere and at your convenience. Charges paid to the lender voluntarily by the borrower or seller to permanently reduce the interest rate. One discount point is equal to 1% of the principal amount of the mortgage; however, 1 point will typically reduce the interest rate by less than 1%. One amount for all charges (except points) to be paid to all loan originators involved in the transaction for originating the loan. Includes application, processing, and underwriting fees, and payments from the lender to the broker for origination. This is the person or company that coordinates the execution of your closing documents. May be called by different titles in different states. Some common terms are attorney, title company, settlement agent, escrow company, notary, among others.